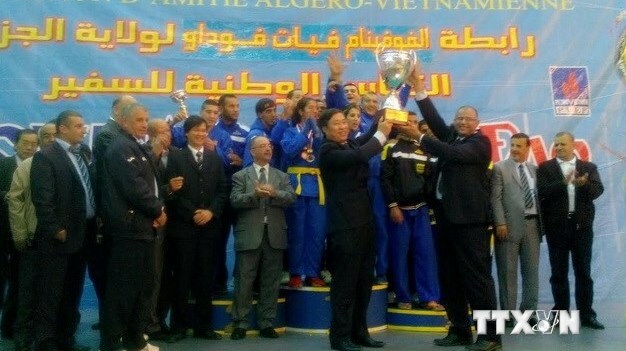 (VOV) -More than 500 athletes gathered on Novbber 7 in the capital city of Alger for the second edition of the Ambassador’s Cup, a traditional Vietnamese martial art (Vovinam) tournament to celebrate the establishment of diplomatic ties. After 2 hours of competition, the National Security Association won the first prize, while the Olympique Bourouba team ranked second and the Ouadsamar team placed third. Vietnam Ambassador to Algeria Vu The Hiep said the event, organised by PetroVietnam Exploration Production Corporation (PVEP), contributed to enhancing the friendship and cooperation relations between the two countries. Vovinam has become popular in the North African country, as evidenced by the establishment of the Algeria Vovinam Federation (FAVV) last August, the Vietnamese diplomat said. As many as 9,000 martial artists practise in 140 Vovinam clubs across the country. Vovinam was introduced in Algeria by martial arts instructor Djouadj Mohamed in 2001 and has progressed since then through successful organization of championships with major national and continental awards and its participation in many international tournaments.